Why would one of my conservative heroes select a liberal-lite to run against the Mike Tyson of political opponents. No, I am not suggesting Obama would bite off the ear of our presidential candidate, but Obama is a Chicago style no-holds-barred politician. If your opposition brings a political stick, you bring a political gun. That's the Chicago Way. Folks, here is the deal. Romney is not a conservative. Yes, Romney has made some conservative choices. But they seem to have come after he has been dragged kicking and screaming to the conservative side of the street. Obamacare is an Obama-nation in regards to freedom. If implemented, Obamacare will end America as we know it. A Herculean effort will be required to repeal Obama's evil socialistic mega-control monstrosity. Can we trust Romney to go "all in" to repeal Obamacare? Intimidated, fearful intellectual conservatives say Obama has the bully pulpit of the White House, the majority of the media, and a billion dollars on his side for re-election. In essence, they believe we have lost our country. They believe a majority of Americans are infected with entitlement mindsets and class envy disease. Obama's media-manipulated, ill-informed infected zombies are going to vote for the guy (Obama) who promises freebies and vows to punish the rich. Driven by fear, the game plan of our smart conservative gurus is to offer a liberal-lite candidate who will also promise freebies, but not so irresponsibly; punish the rich, but not so severely. I believe these conservative colleagues are suffering with Fearful Intellectual Conservative Syndrome. 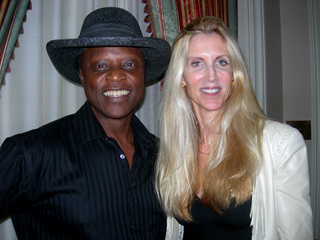 Intellectuals in our party such as Coulter and others are rallying around Romney because they fear America will not elect a pedal-to-the-metal true conservative. They believe we need a liberal-lite to defeat Obama. Meanwhile, we not-so-smart naïve tea party patriots believe a true conservative will win in a landslide. From national to local elections, solid conservatism was a huge winner in 2010. Since then, the pain, suffering, and economic bleeding caused by Obama and his agenda have intensified. Thus, the referendum against him will be far greater in 2012. It is crucial that we exploit this golden opportunity to challenge Obama ideologically by selecting a true conservative presidential candidate. While the Democrats, by far, have been the major offenders, liberalism in both parties has been taking us down the road to destruction for years. In 2012, with a true conservative Republican presidential candidate leading the charge, we can begin taking America back from both parties — pointing her in the right direction on the road to recovery. We did the "liberal-lite thing" in '08 and lost. Remember a guy named John McCain? So, why on earth would we go there again? We know the drill. Here is the play by play. The lib media and Republican elite convince all the "smart people" on our side that only a reasonable "moderate" like Romney can possibly beat Obama. So, out of fear, we select Romney as our 2012 presidential nominee. Upon Romney's officially winning the Republican nomination, the lib media turns on him. Suddenly, they declare Romney a Mormon religious nut. They release all kinds of stories about how electing Romney would equal the personification of evil in the White House. And no left-wing/Democrat exploitation of having a black candidate would be complete without the lib media, NAACP, and the Obama administration finding ways to portray Romney as a stealth KKK card-carrying racist. This would be the left's 2012 presidential campaign against our "moderate" Republican candidate. Since we know the left will attempt to demonize and destroy whoever is our Republican nominee, why not run a thoroughbred, "real deal" conservative? We tea party patriots have more faith in our fellow Americans than do our fearful intellectual conservative colleagues. We believe entitlement mindset and class envy disease have not yet infected a critical mass of Americans. There is still time to vaccinate the infected with the cure and restore our great country to its former glory. The vaccine/miracle cure is Conservatism spread boldly and lavishly by our 2012 presidential candidate. Conservatism won a former actor presidential candidate a 44-state landslide victory in 1980 and a 49 state re-election landslide in 1984. Conservatism can win huge again in 2012.